Do an Internet search and you'll find dozens of Arizona roofing companies. But you'll only find one that unites sustainable practices and products, with top quality craftsmanship and an unwavering commitment to customer satisfaction. 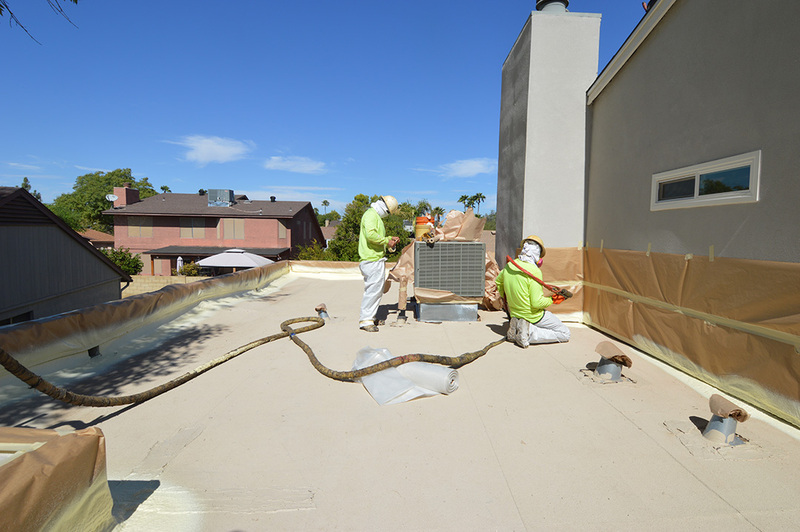 While we offer both traditional as well as eco-friendly roofing materials, we always follow strict, eco-focused installation and disposal practices, regardless of the roofing job. Build it to last for decades: There is no better way to reduce environmental impact of a new roof than to make sure it lasts for many decades. After all, if it winds up lasting 30 years rather than 15, we’ve managed to avoid one full roof being torn off and dumped in a landfill before its time. Recycle, recycle, recycle: Ever wonder what happens to all the rubble that’s created when you remove an old roof? Sadly, almost every Arizona roofer simply sends those old materials to a landfill. What’s worse is that many roofing products carry petroleum-based byproducts, which are far from environmentally safe. Every old roof we remove is sorted and those materials that can be recycled are sent to a special recycling and reclamation facility. Offer greener product alternatives: We’re passionate about roofing. More specifically, we’re passionate about the future of roofing and how innovation is bringing a whole new generation of eco-friendly roofing products. We offer roofing systems that not only avoid negative environmental impact, but actually clean the air that passes over them. We’re constantly testing the most compelling new technologies. If it meets our strict quality standards, we will add it to our portfolio. Our certified applicators offer only those brands that meet our strict requirements for durability, beauty, and warranty protection. We even take the extra step to offer sustainable, eco-friendly options as well as more traditional solutions. In addition to top-tier products, we also look for ways to improve our services through training and by staying apprised of the latest practices and quality standards. 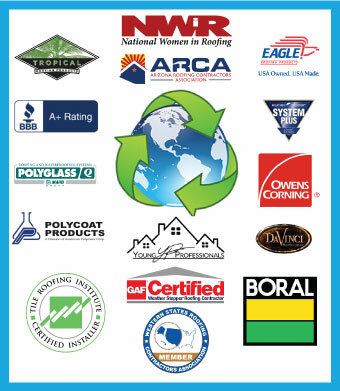 As such, our installers are Manufacturer Certified by some of the most respected brands. We maintain memberships with the Arizona Roofing Contractors Association, the Western States Roofing Contractors Association, The Better Business Bureau, National Women In Roofing, Tile Roofing Institute Certified Installer and many others.